The software can integrate with FedEx Shipping Manager to make shipping and printing of shipping labels much easier. NOTE: For Version 7.1.0.0 and below, map the FEDEX fields to SM_FEDEX table, and SHIPPINGIMPORTEXPORT table for Version 7.1.1.0 to latest. -	Once you’ve successfully mapped all the required fields, go to the admin site → AppConfig parameters and set FedexShipManager.Enabled = true. That’s all it takes for the integration. -	From Orders Menu, click View/Manage Orders. Then select an Order, and then click the button “Send To FedexShipManager”. -	The FEDEX ship manager software will receive shipping tracking number and will be exported to ASPDNSF ShippingImportExport table. -	You need to go back again to Orders Menu → View/Manage Orders and view the Order That Has Been Shipped so that the order will be Mark as Shipped and the order tracking information will be updated in the Orders table. 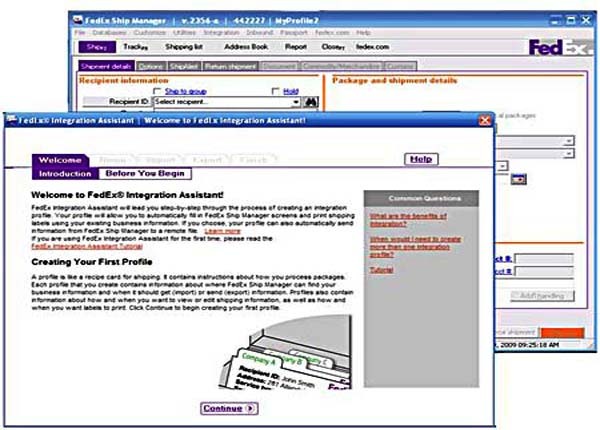 -	The admin user will also be able to see the link in the Order management page and in Customer Account page for customers that will redirect to FedEx tracking web page.